by Emily Smith.In About the frustr8dvideographer, Babies and Families, Blog. If you’re a blog follower or at least someone I’ve seen or spoke to in the last few months, you already know what’s going on. I’m knocked up again! :) This is also why I didn’t schedule any weddings this summer and have been taking it easy in general. I didn’t quit! At least not this job!!! 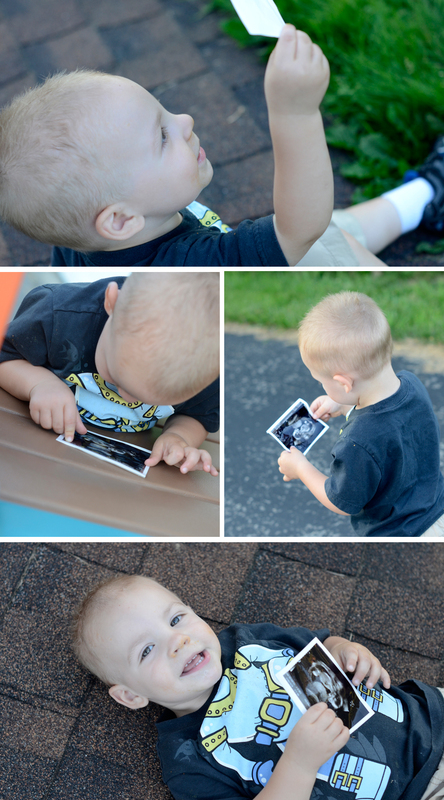 :) Baby Beast #2 is due November 1. Everything is going well so far and my belly is now out there. It no longer looks like I just opted for two Big Macs instead of the one (which isn’t that far from the norm anyway!!). Max doesn’t quite understand or have any idea that he is about to get a baby of his own (he just loves the babies at daycare and runs over to them when we get there and goes “Bee-bee!” and gives them a big hug), but I think he’ll be a great big brother. I was trying to capture him holding the ultrasound pic out towards the camera as if to “show me the pic”, but you try to direct an almost 2 year old! ;) So yay! No work this summer or fall, but get on my calendar for after January 1, 2013!